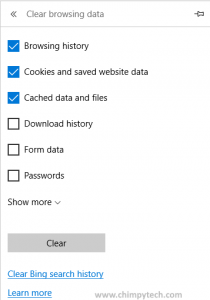 Like most web browsers, Microsoft Edge will collect a bunch of information about your surfing habits as you wander around the internet, and whilst most if this is fairly insignificant, delete browsing data is something that some of the more privacy conscious may want to do from time to time. Automatically every time you exit the browser. We will cover both methods, but before we do we should explain what data is collected, and the effects that deleting browsing data may have on your surfing habits. As you surf the internet, Microsoft Edge will collect data such as cookies, cached pages, and search results, this is all designed to make things easier by allowing websites to personalise content, speed up loading times and generally provide a more polished experience. The problem with this is that many people see this stored data as privacy threat as it could allow anyone with access to your computer to see which websites and pages you have visited as well as a host of other information, which is why many people see deleting browsing data as being a good housekeeping practice. Browsing history This is a brief list of all the websites that the currently logged in user has ever visited. Cookies and saved website data Information that sites store in your computer to remember your preferences and help personalise your experience. Cached data and files Copies of web pages that have been visited as well as temporary internet files. Download history A list of all files downloaded from the internet (Note - Clearing this will only delete the list not the actual downloaded files themselves). Form Data Information that has been entered into web page forms. e.g. email address, name, etc. Passwords Any passwords that have been saved for websites. 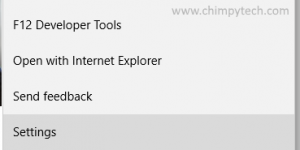 Open Microsoft Edge to any page of your choice. Click the ‘three dots’ icon to open the menu. Click on the ‘Settings’ option at the bottom of the list. In the last screen you will see a list of the types of data that can be deleted, simply check the boxes of the data you wish to delete, and click ‘Clear’ to complete the deletion.